CATALINA – Two conservation staffers from the Catalina Island Conservancy got a big surprise the morning of June 1 while walking the beach near Catalina Island’s Emerald Bay. Wildlife biologist, Tyler Dvorak, and conservation operations coordinator, Amy Catalano, were conducting a breeding bird survey when they came across a large oarfish. The carcass of the fish, estimated to be close to 13 feet in length, had recently washed up on the beach. This is the second time in less than two years an oarfish has been found on Catalina Island. 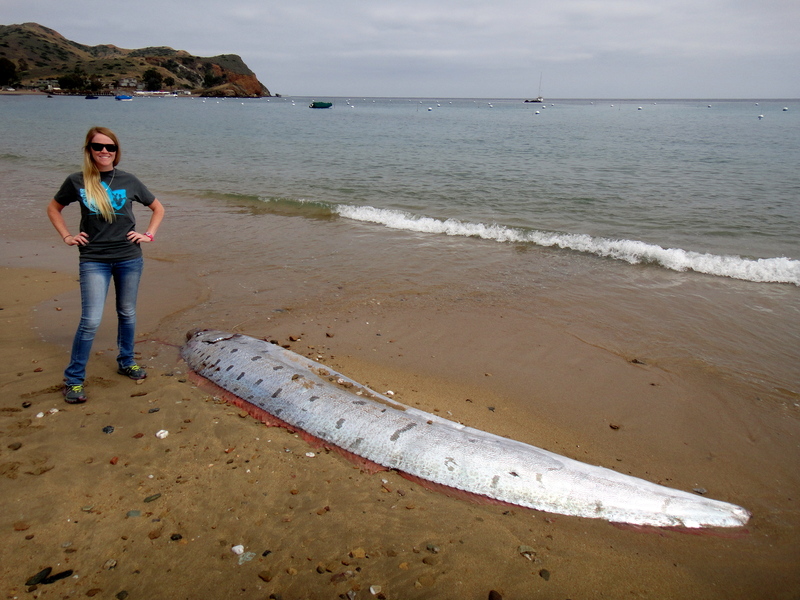 In October 2013, two other Catalina Island Conservancy staffers came across an 18-foot oarfish floundering in the shallows; it later died and was pulled ashore. Oarfish are pelagic fish usually inhabiting the deep waters of the ocean and are rarely seen near the coast. With their long, slender, silvery bodies, and bright red elongated dorsal fins, ancient mariners sometimes mistook oarfish as sea serpents.